Caroline Appleby arrives in Hollywood en route to Hawaii and decides to visit her "dear" friends, Lucy and Ethel. Naturally, she wants to meet some of the movie stars whom Lucy has supposedly befriended. When Lucy learns of Caroline's stopover, she is left with no alternative but to trick her. While Mrs. Appleby watches from a balcony high above the hotel pool, Lucy flirts with Van Johnson. But what Lucy's friend from New York can't see is that Johnson is fast asleep. When Lucy discovers that Caroline, who suffers from nearsightedness, has lost her glasses on the plane, she compounds her chicanery by mentioning that she and Johnson are partners in a dance act being featured at the hotel nightclub. What a shame that Caroline has no glasses and can't watch a rehearsal. But the airline suddenly returns the missing spectacles and Caroline is dying to see Lucy perform with the movie idol. 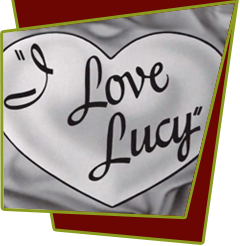 Desperate, Lucy races to Johnson's side and pleads with him for a chance to be his "partner" for just a few minutes. Lucy: "I'll name my next child after you, If I have one. If I don't, I'll change the name of the one I have." Johnson reluctantly agrees and, while Marco Rizo accompanies the duo on the piano, Lucy and Van dance to "How About You?" as Ethel and Caroline look on. Caroline is thrilled, envious of Lucy's being able to "rub elbows with the stars." Lucy confirms the "awful" truth: "Our elbows are practically raw!" That night, much to Lucy's surprise and delight, Johnson phones and asks her to be his dance partner (Hazel, his usual companion, is ill). After a little initial nervousness, the nightclub number goes well. Caroline rushes backstage to congratulate Lucy and lets her know she has decided to stay an extra day in order to attend the "open house" Lucy plans to throw for all the stars. Special Notes: Ray Bolger was originally supposed to be the "Dancing Star" but had to back out at the last minute and was replaced with Van Johnson. Johnson apparently worked out the sponsor conflicts as a spokesman for Lucky Strike cigarettes in order to appear in this episode.